Voted Best Independent VIP Hosting Company for 2011. That’s two years in a row. Thanks to everyone for their votes! Summer is finally here! Everyone is making plans for their summer getaway. Summer 2012 is expected to have the highest visitor total in Las Vegas history. In fact, 2011 came in at the second highest visitor total with 38.9 million visitors (LVCA, 2012). Las Vegas has officially risen again as the entertainment capital of the world, rivaled only by Ibiza in dayclub and nightlife activity. Red Carpet VIP has been making some big changes. We have moved to a new, larger office location and made some improvement to our core business in order to provide our customer with an unparalleled Las Vegas VIP experience. Red Carpet VIP has received thousands of testimonials from clients worldwide. You can find us on Yelp, Facebook and Twitter. Red Carpet VIP is the largest table provider at all nightclubs and pool parties in Las Vegas. Red Carpet VIP has served over 200,000 clients for nightclub and pool party service in the last 5 years. While most in our competition may host 1 or 2 parties each weekend, we coordinate and plan somewhere between 75 and 150 parties every week. All Red Carpet VIP clients are pre-paid and receive a contract guaranteeing both their reservation and the price of the package. YOU CAN BE CONFIDENT KNOWING THAT YOU AND YOUR GROUP ARE IN GOOD HANDS AND WILL BE TREATED LIKE A TRUE VIP DURING YOUR VISIT. Is Downtown becoming the New Uptown? If you’re in the mood for a completely different Las Vegas experience you can head downtown to what many call Old Vegas. Downtown is highlighted by Fremont Street and The Fremont Street Experience where you’ll always be shaded from the sun or treated to an amazing light show that spreads blocks under an enormous canopy. 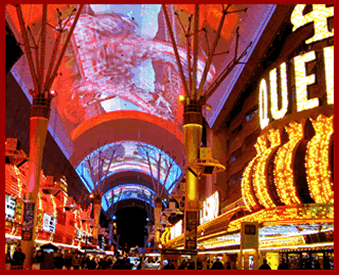 Fremont Street has legendary casinos, free entertainment and excellent gambling. On any given night you may see famous bands, showgirls strolling down the street, or an amazing saxophone performance. While some say it’s the free entertainment that makes Fremont Street feel vintage , others say it’s the history. Las Vegas started over 100 years ago in 1905 near the corner of Fremont and Main Street. One little known Las Vegas fact is Fremont Street was the first paved street in the Valley. Over the past couple of years, downtown Vegas has experienced a renaissance of activity that has injected it with new energy and turned it into a completely different Vegas experience instead of an afterthought. Downtown Vegas has erupted in a multifold of new bars and restaurants and many of the historical casinos are being renovated to apeal to the new trendier Las Vegas scene. Fitzgeralds Casino & Hotel is undergoing a dramatic transformation to become the D Casino Hotel. The D transformation is happening right now and is scheduled for completion in fall 2012. Upon completion, the D will have daily live entertainment, Vegas’ only two-level casino, and two high-energy bars – the LONGBAR and the D Bar – situated in the casino and on the Fremont Street Experience, respectively. The D isn’t the only casino undergoing high energy renovations. Golden Gate Casino, Gold Spike and Plaza have all recently been renovated. If you’re looking for a jolt of energy, you’ll enjoy the Fremont Street zipline. Fremont Street Flightlinez offers the opportunity to zip along the entire length of the Fremont Street Experience‘s Viva Vision canopy at speeds of up to 30 miles per hour. Electric Daisy Carnival, North America’s largest electronic dance music festival, returns June 8-10, 2012, to the Las Vegas Motor Speedway. The celebration of electronic dance music’s takeover in Las Vegas will include pool parties and nightlife events featuring world class venues and production. Red Carpet VIP has exclusive access to all EDC nightclub and pool party events. Tickets are selling out fast. Contact us today to reserve your spot. Marquee Dayclub at The Cosmopolitan of Las Vegas — EC Twins and Steve Castro. LAVO Nightclub at The Palazzo — Hardwell Presents Revealed with Hardwell, Dannic, Dyro. Marquee Nightclub at The Cosmopolitan of Las Vegas — Benny Benassi & Friends with Benny Benassi, Cedric Gervais, Alex Gaudino. TAO Nightclub at The Venetian — Apollo Road with ATB and Dash Berlin. Marquee Dayclub at The Cosmopolitan of Las Vegas — Above & Beyond and Mat Zo. TAO Beach at The Venetian — Nicky Romero. LAVO Nightclub at The Palazzo — A-Trak Presents Fools Gold. Marquee Nightclub at The Cosmopolitan of Las Vegas — David Lewis Productions Presents Armin van Buuren, Sander van Doorn, EDX, Jochen Miller. TAO Nightclub at The Venetian — Fedde Le Grand. Marquee Dayclub at The Cosmopolitan of Las Vegas — Dirty South & Friends featuring Dirty South and Tommy Trash. TAO Beach at The Venetian — Spin Agency Presents Cosmic Gate, Arty, Glenn Morrison, Rebecca & Fiona. Marquee Nightclub at The Cosmopolitan of Las Vegas — Kaskade. TAO Nightclub at The Venetian — Subliminal Sessions Presents Erick Morillo, Sunnery James & Ryan Marciano. Marquee Dayclub at The Cosmopolitan of Las Vegas — Levels featuring Avicii and Gareth Emery. TAO Beach at The Venetian — Back 2 Back: Markus Schulz and Ferry Corsten. LAVO Nightclub at The Palazzo — Vice Sundays Featuring DJ Vice. Marquee Dayclub at The Cosmopolitan of Las Vegas — Be Yourself featuring Danny Tenaglia, Victor Calderone, Nicole Moudaber. Marquee Nightclub at The Cosmopolitan of Las Vegas — Party Rock featuring Red Foo and Chuckie. Looking for the best hotel deal in Las Vegas? Red Carpet VIP can help you find it. Even if you have already made your hotel reservation. Take the RCVIP Hotel rate challenge! Just send your current hotel itinerary to gary@vipnight.com for a free upgrade review. If we can save you any money, we will promptly let you know and handle all applicable changes and cancellations to your current reservations. Even if you have not booked your reservation; call, email or text Red Carpet VIP hotels and we will respond right away to your reservation inquiry. Ask about the hotest new hotels on the strip! We only require a $50 deposit total regardless of the amount of rooms you book. Group Payment Links. No longer does one person have to put the total amount on their credit card and have everyone pay them back. We set up payment links online so the total amount can be split between the group and everyone can go online and pay their portion with their own credit card for the rooms and the nightlife. Red Carpet VIP Hotels can help plan almost every aspect of your trip. Our Clients LOVE the fact that we make it so simple to deal with ONE company for their entire Las Vegas trip. Las Vegas largest independent VIP nightlife hosting company.